It has been a month already since we have purchased a 100 GHS Bitcoin cloud mining contract at Lunamine, the service that probably has the current lowest price per GHS for BTC cloud mining. For our 100 GHS BTC mining contract we’ve had to pay 0.25234804 or a little over 0.0025 BTC per GHS and currently the price is still pretty much the same just some hours before another network difficulty increase. For the past month we have mined with our 100 GHS we have already reached almost 33% return of the initial investment in the hasrate, definitely not bad for just a month of mining. Because of the steady increase in the Bitcoin network hashrate it will not be just 3 months for the full ROI, but more like 4 months, depending on the speed of difficulty increase, but even 4 months is not bad at all. Thought he actual profit after that will not be very big for our 100 GHS as long as the mined coins are more than the fee for electricity at the service the mining contract will continue to run. And we’ve already calculated that it will take at least 8 months if the price remains the same and the difficulty increases with about 10% at each readjustment, so probably the lifetime of 100 GHS contract will be about a year. If you get more hashrate however the lifetime of the contract will be even longer. Do note that this service is still very new, so we still advice caution if investing in it and as usual a word of warning – do not invest more BTC than you can afford to loose. It seems that the currently most affordable in terms of price Bitcoin cloud mining services – PBMining and Bitcoin Cloud Services might have some new competition. 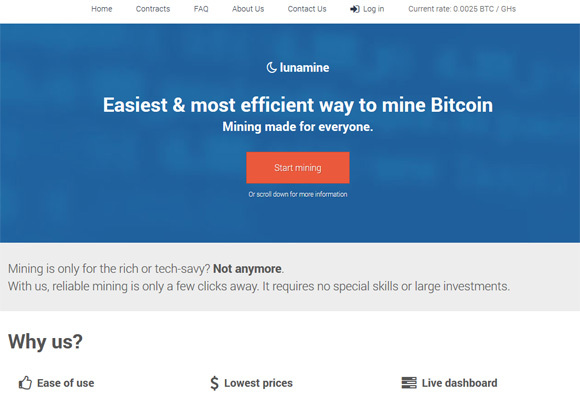 By new we really mean new, as a new BTC cloud mining service was apparently very recently launched in Sweden called Lunamine. We normally do not review services that were just launched and usually give them some time to see if they are not just some sort of a new scam and to give them some time to fix bugs and improve the features they offer before reviewing them, however we were asked by readers to check this new service out and we have decided to do so. What makes this new service interesting, and by new we really mean new as their domain name was registered on 30th June this year or a little over a week ago, is the fact that they claim to offer pretty much the best price per GHS for Bitcoin cloud mining. They even manage to beat some other services that were fighting to offer the best price to customers by a bit, like the two we already mentioned. The current rate stated on their website is 0.0025 BTC per GHs, but the real rate can be slightly higher due to the variance in BTC exchange rate. They accept payments in BTC only, though the contract prices are listed in USD prices and they apparently calculate how much BTC you need to pay with the current exchange rate for the contract you have chosen based on the USD price. 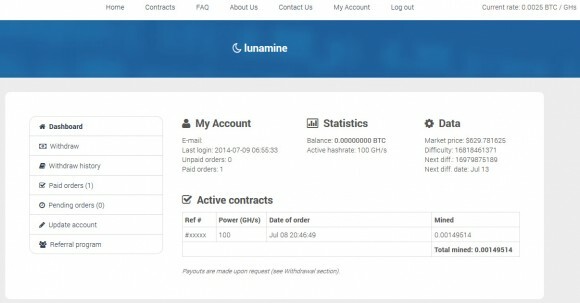 Initially Lunamine has launched a free 7 day trial with 10 GHS for people to try their service, but apparently this was very quickly stopped due to people abusing it (according to the official information published). 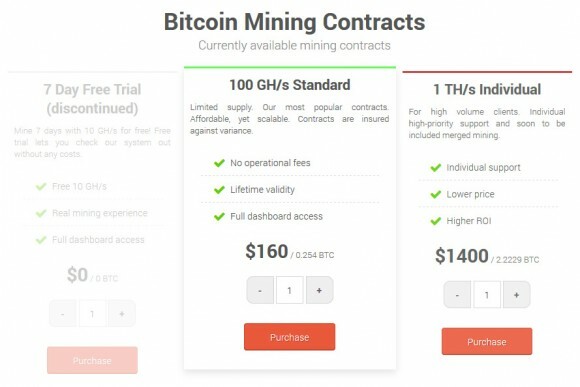 So at the moment you can purchase a contract of minimum 100 GHS for $160 USD or about 0.254 BTC, or go for a 1 THS contract for $1400 USD or about 2.2229 BTC (you can get multiple of these as well). We have chosen the 100 GHS contract for our testing and yesterday when we have purchased it e had to pay 0.25234804 BTC for it or about 0.00252 BTC per GHs. You will probably notice that there is no term period cited for the contracts duration, something that is a bit confusing as it says “Lifetime validity” and “No operational fees” when you are about to purchase a contract. There is a catch though, as Lifetime validity actually means until the hashrate purchased by you actually brings some profit for you when you pay for the electricity cost. Yes, there may be “No operational fees”, however you need to pay fee for electricity used and the rate is $0.0032 per GHS per day, and so for a 100 GHS contract you have to pay $0.32 USD a day for electricity and the rest of the mined coins you get as profit. Doing a quick calculation shows that at the moment you can mine around 0.00299 BTC per day with 100 GHS hashrate or your daily profit will be around $1.85 USD minus the $0.32 USD fee for electricity or around $1.50 USD with the current network difficulty of Bitcoin. This would take around 106 days or about three months and a half for you to break even on your investment and actually start earning on to of what you have invested if the conditions remain the same as in the current moment… and they will not be as the network difficulty will continue to rise. So do have in mind that as in about three months and a half from now if the network difficulty continues to rise with 10% you will be making about half of what you can currently mine with the same hashrate and the fee for the used power will remain the same. If you remain with only 100 GHS the lifetime of this contract will be roughly about 230-240 days or about 8 months before the mined coins will not be able to cover the electricity fee, that is if the price of Bitcon remains the same and the network difficulty continues to increase by about 10% each time, so not that accurate calculation. After we have purchased our contract it took about an hour for the payment to be processed and in about two hours the contract was activated, though this may take up to 12 hours according to the service description. Another thing to note is that while your mined coins get credited in your account, there is no automatic daily or weekly payout, you need to request the payout manually and in order to do so you need to already have accumulated at least 0.01 BTC. Furthermore since the payouts are apparently processed manually it can take up to 48 hours for your request to be fulfilled again according to the official information published about the service. We haven’t tried withdrawing yet as we’ve just started testing the service and have not yet generated enough BTC in order to be able to request a withdraw of the mined coins. An important word of advice though, we have just started testing this service and since the service is really very new we do recommend serious caution! If you are interested in trying it out always start with a minimum investment and with something that you can afford to loose if things go bad. We are going to continue using the service and will be reporting how things progress with it as well as our own experience using the service.